We had made plans for this year. As mentioned in our previous blogs, we had planned a 3-week cycle tour round the Outer Hebrides in May. But the weather was against us. Scotland had the worst weather this year; there was still snow on the mountains in midsummer! We made it as far as Oban, but then decided the safest option was to bale out due to the gale-force winds forecast. We had also hoped to do a longer trip to France; 6 weeks instead of 3, the maximum we’d been able to find time for so far. But ‘life is what happens to you while you’re busy making other plans’, as the John Lennon song goes. And life did happen. My dear sister-in-law, Mike’s little sister, Catherine, lost her battle against cancer and died at the end of July. Even as I write this, I still can’t believe it. We all knew she was ill, but then she seemed to deteriorate so quickly … it all came as a bit of a shock. Even though she was suffering, she still managed to smile and make a joke to get us all laughing. She has my deepest admiration for being so brave. We miss her so much. But, she wouldn’t want us to sit around grieving for her. She would want us to get up and carry on doing the things we love doing. With this in mind, even though it was a little late in the year, we took ourselves off at the end of September to cycle the Hadrian’s Wall route. It turned out to be a very emotional week for us, which took us a little by surprise. Doing the things we love seemed to bring it home that the person we had lost could no longer do these things. Grief hits you when you least expect it. But then we comforted ourselves by thinking that Cath would be watching us, and even that she had put in a good word for us so that we had good weather – wall-to-wall sunshine, every day in fact! Somehow, we had managed to choose the week of the Indian summer. We started our ride at Port Carlisle, where we were able to leave our car. The first day we spent exploring the Solway Coast AONB (Area of Outstanding Natural Beauty). The road round the peninsula is flat, my favourite type of cycling! The area has an air of tranquility and peacefulness about it, which is just what we needed. It is a good spot for birdwatching, and we could see – and hear – skeins of geese flying in for winter. Our camp was close to the shoreline and we were lulled to sleep by birdcalls and owl hoots and screeches. However, in the middle of the night, I woke to hear water lapping close to the tent and remembered the sign we’d seen on the road alongside where we were camped: ‘When water reaches this point, maximum depth is 1 foot’. Perhaps the high tide also covered the field in which we were pitched? We could end up under a foot of water! My mind started racing. ‘Mike, Mike, wake up! The water has reached our tent!’ Heroically, Mike dragged himself out of his snug and cosy sleeping bag to investigate. Fortunately, all was well. I had forgotten to take into account that sound carries at night – we weren’t going to disappear under a foot of seawater! We spent the next few days cycling and exploring. After a flat start, the ride became very hilly and we made it up on to the fells of the North Pennines and cycled alongside Hadrian’s Wall. It seems hard to believe that Roman soldiers had actually marched from Italy to this area of Britain and built a wall to mark Rome’s northern frontier. What must life have been like for them in those days? The occasional hill just had to be walked up!! We had the most amazing views across this beautiful landscape. With the clear skies and full sunshine, we could see for miles. A rare occurrence in the hills! The NCN route undulated along quiet, country lanes, through small, rural villages until it reached the town of Haltwhistle, nicknamed the centre of Britain due to its position exactly in the middle of the country. We camped the night here, but in view of the change in the weather and the fact that Newcastle was hosting a World Cup rugby match that weekend so would be chock-a-block, we decided to beat a retreat and the next day caught the train back to Carlisle. From there we cycled back to Port Carlisle, our car and the journey home. The short break, the remoteness and the stunning scenery were exactly what we needed, but we returned home sad in the knowledge that we wouldn’t be able to tell our dear Cath all about it. What we have to do is believe that she was, and always will be, with us all the way. RIP Catherine Jenkins, a beautiful person who was very much loved and who will be forever missed. Categories: Autumn, Bike, Bike packing, Camping, Cumbria, Cycle camping, Cycle touring, cycling, good health, Mike McEnnerney, Northumberland, photographer, Photographic, Photography, PhotoLink Images, thepedallingphotographer.com, Tourism, Travel, UK, Vacation | Tags: Bicycle, Bicycle touring, Birdwatching, Coastline, Cumbria, Cycle Camping, Cycle touring, cycle tourists, Cycling, England, Hadrian's Wall, Historic, History, Mike McEnnerney, National Cycle Network, Nature, NCN, Northumberland, Photography, Roman wall, Sustrans, The pedalling photographer, transportation, Travel, Travel and Tourism, UNESCO | Permalink. Despondently making our way back home from our aborted cycle tour of the Outer Hebrides, we decided to break the journey approximately halfway rather than driving until the early hours of the morning. Knowing the area from previous trips, we pulled off the M6 motorway at Junction 37 and made our way to the little village of Dent, snuggled in the narrow valley of Dentdale, on the western slopes of the Pennines and not far from the town of Sedburgh. In the centre of the village there is a great campsite, High Laning Farm, run by a lady that we know as Margaret. The campsite consists of a fabulous flat field with great views of the surrounding fells, and is only a two-minute walk from the pubs! We had been to Dent on several previous occasions, but most memorably when walking the Dales Way some 10–12 years ago, when we were still sprightly young things whose joints could handle long-distance walking! It is a picturesque little village, with quaint cobbled streets. Its most famous resident was Adam Sedgwick (1785–1873), who was one of the founders of modern geology. In the centre of the village, there is a fountain made from pink granite to commemorate this famous field geologist. In the 18th century, Dent was also famous for its knitters, both men and women, who often knitted while walking to their work in the fields. Their hand-knitted socks, gloves and woollen caps provided them with an important supplementary income. Because the village folk could knit so fast, and because of the curious way they rocked backwards and forwards as they knitted, they became known as the ‘terrible knitters of Dent’. Lying between the Lake District and the edge of the Yorkshire Dales National Park, but actually located in Cumbria, Dentdale is ideally situated for visiting both areas. However, as seems to be the case with a lot of villages these days, Dent has lost its Post Office and some of its traditional arts and crafts shops. In the past, there was also a bakehouse and a cheese factory, and the general stores had even generated electricity! However – importantly 🙂 – the village still has its own CAMRA award-winning brewery close by, and three pubs; surely an attraction for most visitors! 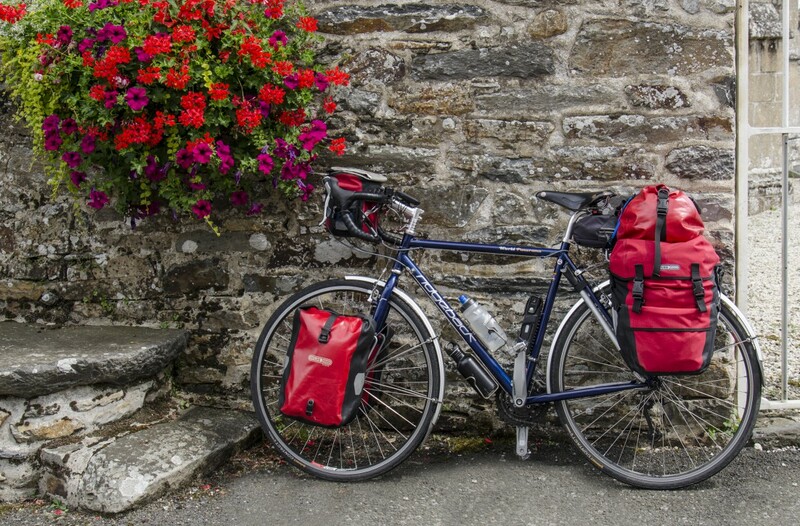 As well as being a perfect base for some truly stunning walks, it is also ideally situated for cyclists as the Yorkshire Dales Cycleway and the Pennine Cycleway both pass through Dent. There are many off-road routes, quiet country lanes and lots of hills (if you are so inclined – give me (Chris) a gently undulating or, even better, a flat road any time!) to explore. So, next time you are in this area, stop and check out the village of Dent – it is a quaint little place full of character and makes a great base for some wonderful bike rides and hill walks. Categories: Backpacking, Bike, Bike packing, Camping, Cycle camping, Cycle touring, cycling, good health, Hiking, Holiday, Mike McEnnerney, photographer, Photographic, Photography, Spring, thepedallingphotographer.com, Tourism, Travel, UK, Vacation, Walking | Tags: Bicycle, Bicycle touring, Camping, Campsite, Cumbria, Cycle Camping, Cycle touring, cycle tourists, Cycling, Dent, Dentdale, England, Mike McEnnerney, National Cycle Network, National Parks, outdoors, Photography, The pedalling photographer, transportation, Travel, Travel and Tourism, Yorkshire, Yorkshire Dales | Permalink. A Couple, a couple of Bromptons and a couple of first time bloggers!